That is John 11:35. The shortest verse in the Bible. . . And this will probably be my shortest writing. 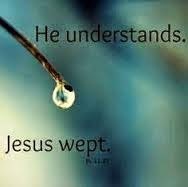 Jesus wept when He found out about the death of His friend Lazarus. Jesus loves His friends so much. He feels their pains. He understands what they are going through. He empathises with them.